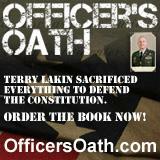 Monday, Feb 25, 2013, 3p ET: Interview with John Bernard and Colonel Jim Harding. Put it on your calendar now. Who is John Bernard? John is the father of a soldier killed in Afghanistan due to the confusing rules of engagement in force in our military. He will tell us his story. We will then be joined by Colonel Jim Harding who will further clarify the problems with the current REO policies . Ret. Marine 1st Sgt. 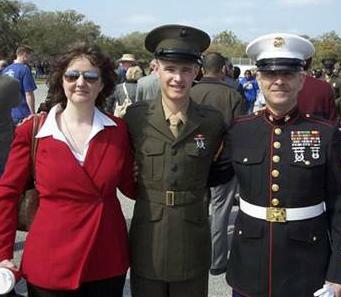 John Bernard, right, with his wife, Sharon and late son, Marine Lance Cpl. Joshua Bernard, at Joshua's graduation from Marine boot camp, on Parris Island, S.C., in March 2007. 3:00pm--3:30pm Eastern We Open with John Bernard: The first half hour of radio show, Marco will interview 26 year Marine Veteran, 1st Sergeant John Bernard, from Massachusetts. John lost his only son, Joshua, when Joshua served as a soldier in Afghanistan, due to the "Rules of Engagement" that endanger our troops everyday and cause senseless casualties in the war. 1st Sergeant John Bernard will be addressing the ROE and the negative ramifications of these rules upon our nation's military. 3:30pm--4:00pm Eastern Colonel Jim Harding Joins Us: Colonel Jim Harding, Veteran Defenders of America, will come on the program to continue the discussion of the ROE and give his opinions regarding this reckless and risky war strategy. In the final 15 minute segment of the radio show, Colonel Jim Harding will briefly touch on the 2nd Amendment and Obama's attempt to disarm America's citizenry.